For his grandson, the cricketer, see George Cayley (cricketer). Designed first successful human glider. Discovered the four aerodynamic forces of flight weight, lift, drag, thrust and cambered wings, basis for the design of the modern aeroplane. In 1799, he set forth the concept of the modern aeroplane as a fixed-wing flying machine with separate systems for lift, propulsion, and control. He was a pioneer of aeronautical engineering and is sometimes referred to as "the father of aviation." He discovered and identified the four forces which act on a heavier-than-air flying vehicle: weight, lift, drag and thrust. Modern aeroplane design is based on those discoveries and on the importance of cambered wings, also identified by Cayley. He constructed the first flying model aeroplane and also diagrammed the elements of vertical flight. He designed the first glider reliably reported to carry a human aloft. He correctly predicted that sustained flight would not occur until a lightweight engine was developed to provide adequate thrust and lift. The Wright brothers acknowledged his importance to the development of aviation. Cayley represented the Whig party as Member of Parliament for Scarborough from 1832 to 1835, and in 1838, helped found the UK's first Polytechnic Institute, the Royal Polytechnic Institution (now University of Westminster) and served as its chairman for many years. He was a founding member of the British Association for the Advancement of Science and was a distant cousin of the mathematician Arthur Cayley. Cayley, from Brompton-by-Sawdon, near Scarborough in Yorkshire, inherited Brompton Hall and Wydale Hall and other estates on the death of his father, the 5th baronet. Captured by the optimism of the times, he engaged in a wide variety of engineering projects. Among the many things that he developed are self-righting lifeboats, tension-spoke wheels,  the "Universal Railway" (his term for caterpillar tractors), automatic signals for railway crossings, seat belts, small scale helicopters, and a kind of prototypical internal combustion engine fuelled by gunpowder. He suggested that a more practical engine might be made using gaseous vapours rather than gunpowder, thus foreseeing the modern internal combustion engine. He also contributed in the fields of prosthetics, air engines, electricity, theatre architecture, ballistics, optics and land reclamation, and held the belief that these advancements should be freely available. According to the Institution of Mechanical Engineers George Cayley was the inventor of the hot air engine in 1807: "The first successfully working hot air engine was Cayley's, in which much ingenuity was displayed in overcoming practical difficulties arising from the high working temperature." His second hot air engine of 1837 was a forerunner of the internal combustion engine: "In 1837, Sir George Cayley, Bart., Assoc. Inst. C.E., applied the products of combustion from close furnaces, so that they should act directly upon a piston in a cylinder. Plate No. 9 represents a pair of engines upon this principle, together equal to 8 HP, when the piston travels at the rate of 220 feet per minute." He is mainly remembered for his pioneering studies and experiments with flying machines, including the working, piloted glider that he designed and built. He wrote a landmark three-part treatise titled "On Aerial Navigation" (1809–1810), which was published in Nicholson's Journal of Natural Philosophy, Chemistry and the Arts. The 2007 discovery of sketches in Cayley's school notebooks (held in the archive of the Royal Aeronautical Society Library) revealed that even at school Cayley was developing his ideas on the theories of flight. It has been claimed that these images indicate that Cayley identified the principle of a lift-generating inclined plane as early as 1792. To measure the drag on objects at different speeds and angles of attack, he later built a "whirling-arm apparatus", a development of earlier work in ballistics and air resistance. He also experimented with rotating wing sections of various forms in the stairwells at Brompton Hall. "About 100 years ago, an Englishman, Sir George Cayley, carried the science of flight to a point which it had never reached before and which it scarcely reached again during the last century." These scientific experiments led him to develop an efficient cambered airfoil and to identify the four vector forces that influence an aircraft: thrust, lift, drag, and gravity. He discovered the importance of the dihedral angle for lateral stability in flight, and deliberately set the centre of gravity of many of his models well below the wings for this reason; these principles influenced the development of hang gliders. As a result of his investigations into many other theoretical aspects of flight, many now acknowledge him as the first aeronautical engineer. His emphasis on lightness led him to invent a new method of constructing lightweight wheels which is in common use today. For his landing wheels, he shifted the spoke's forces from compression to tension by making them from tightly-stretched string, in effect "reinventing the wheel". Wire soon replaced the string in practical applications and over time the wire wheel came into common use on bicycles, cars, aeroplanes and many other vehicles. The model glider successfully flown by Cayley in 1804 had the layout of a modern aircraft, with a kite-shaped wing towards the front and an adjustable tailplane at the back consisting of horizontal stabilisers and a vertical fin. A movable weight allowed adjustment of the model's centre of gravity. Around 1843 he was the first to suggest the idea for a convertiplane, an idea which was published in a paper written that same year. At some time before 1849 he designed and built a biplane in which an unknown ten-year-old boy flew. Later, with the continued assistance of his grandson George John Cayley and his resident engineer Thomas Vick, he developed a larger scale glider (also probably fitted with "flappers") which flew across Brompton Dale in front of Wydale Hall in 1853. The first adult aviator has been claimed to be either Cayley's coachman, footman or butler: one source (Gibbs-Smith) has suggested that it was John Appleby, a Cayley employee: however there is no definitive evidence to fully identify the pilot. An entry in volume IX of the 8th Encyclopædia Britannica of 1855 is the most contemporaneous authoritative account regarding the event. 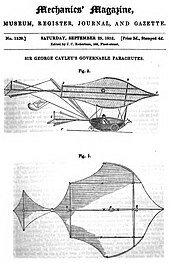 A 2007 biography of Cayley (Richard Dee's The Man Who Discovered Flight: George Cayley and the First Airplane) claims the first pilot was Cayley's grandson George John Cayley (1826–1878). A replica of the 1853 machine was flown at the original site in Brompton Dale by Derek Piggott in 1973 for TV and in the mid-1980s for the IMAX film On the Wing. 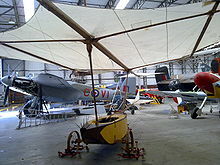 The glider is currently on display at the Yorkshire Air Museum. Another replica, piloted by Allan McWhirter, flew in Salina, Kansas just before Steve Fossett landed the Virgin Atlantic GlobalFlyer there in March 2003, and later piloted by Richard Branson at Brompton in summer 2003. Cayley is commemorated in Scarborough at the University of Hull, Scarborough Campus, where a hall of residence and a teaching building are named after him. He is one of many scientists and engineers commemorated by having a hall of residence and a bar at Loughborough University named after him. The University of Westminster also honours Cayley's contribution to the formation of the institution with a gold plaque at the entrance of the Regent Street building. There are display boards and a video film at the Royal Air Force Museum London in Hendon honouring Cayley's achievements and a modern exhibition and film "Pioneers of Aviation" at the Yorkshire Air Museum, Elvington,York. The Sir George Cayley Sailwing Club is a Yorkshire-based free flight club, affiliated to the British Hang Gliding and Paragliding Association, which has borne his name since its founding in 1975. In 1974, Cayley was inducted into the International Air & Space Hall of Fame. 1. Sir George Cayley, 6th Bt. ^ "George Cayley's life". hotairengines.org. "Sir George Cayley". Flyingmachines.org. Retrieved 26 July 2009. "The Pioneers: Aviation and Airmodelling". Retrieved 26 July 2009. "U.S Centennial of Flight Commission – Sir George Cayley". Archived from the original on 20 September 2008. Retrieved 10 September 2008. ^ "Aviation History". Retrieved 26 July 2009. ^ "Sir George Cayley (British Inventor and Scientist)". Britannica. Retrieved 26 July 2009. ^ "Sir George Cayley". U.S Centennial of Flight Commission. Retrieved 10 September 2008. ^ a b c "The Pioneers: Aviation and Airmodelling". Retrieved 26 July 2009. ^ In his notebook, dated March 19, 1808, Cayley proposed that in order to produce "the lightest possible wheel for aerial navigation cars," one should "do away with wooden spokes altogether and refer the whole firmness of the wheel to the strength of the rim only, by the intervention of tight strong cording … " See: J.A.D. Ackroyd (2011) "Sir George Cayley: The invention of the aeroplane near Scarborough at the time of Trafalgar," Journal of Aeronautical History [Internet publication], paper no. 6, pages 130–181. Cayley's tension-spoke wheel appears on page 152, "3.7 The Tension Wheel, 1808". ^ "Sir George Cayley's patent universal railway," Mechanics' Magazine, 5 (127) : 225–227 (January 28, 1826). ^ George Cayley (February 13, 1841) "Essay on the means of promoting safety in railway carriages," Mechanics' Magazine, 34 (914) : 129–133. See also letters in reply on pages 180–181. ^ Raleigh, W; The War in the Air, Vol. 1, Clarendon 1922. ^ Ackroyd, J.A.D. Sir George Cayley, the father of Aeronautics Notes Rec. R. Soc. Lond. 56 (2), 167–181 (2002). Retrieved: 29 May 2010. ^ "Cayley's 1807 Hot Air Engine". hotairengines.org. ^ "Cayley's 1837 Hot Air Engine". hotairengines.org. ^ Cayley, George. "On Aerial Navigation" Part 1 Archived 11 May 2013 at the Wayback Machine , Part 2 Archived 11 May 2013 at the Wayback Machine , Part 3 Archived 11 May 2013 at the Wayback Machine Nicholson's Journal of Natural Philosophy, 1809–1810. (Via NASA). Raw text. Retrieved: 30 May 2010. ^ Dee, Richard (2007). The Man who Discovered Flight: George Cayley and the First Airplane. Toronto: McClelland and Stewart. ISBN 978-0-7710-2971-4. ^ Pritchard, J. Laurence. Summary of First Cayley Memorial Lecture at the Brough Branch of the Royal Aeronautical Society Flight number 2390 volume 66 page 702, 12 November 1954. Retrieved: 29 May 2010"
^ John Lloyd and John Mitchinson; QI: The Second Book of General Ignorance, Faber & Faber 2010, Page 1. ^ Cayley Flyer, oldest plane welcomes home Virgin Atlantic GlobalFlyer Virgin, 4 March 2005. Retrieved: 29 May 2010. ^ Duplicate better than the original Popular Mechanics page 20, November 2003. Retrieved: February 24, 2017. ^ "Sir George Cayley Sailwing Club". cayleyparagliding.co.uk. Retrieved 5 July 2015. Gerard Fairlie and Elizabeth Cayley, The Life of a Genius, Hodder and Stoughton, 1965. This page was last edited on 10 March 2019, at 13:01 (UTC).